So last night was really scary for everyone. 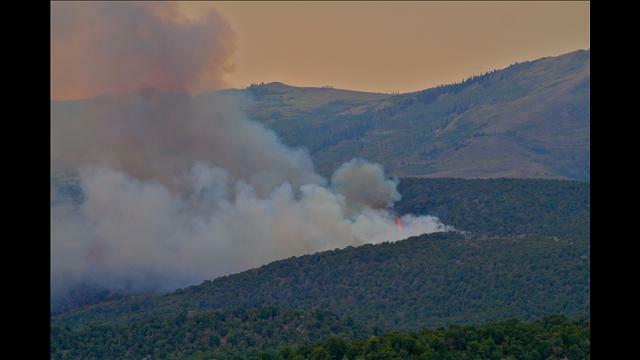 On our way home, the radio cut out and announced a fire in Eagle County, accidentally naming the wrong ridge; it said the fire was up Bellyache. I call my best friends out here who live on the other side of Bellyache to ask if they can see the flames and they say yes, CASTLE PEAK/CASTLE PEAK RANCH is burning. Guess where Mr. Cello resides?? Yeah. So I call the ranch owner, who is in the process of packing up/making evac plans/calling everyone he can and it’s true. The fire had been burning up Eby Creek way but we heading for Castle Peak Ranch, and they had just in the last 5 minutes issued an evacuation standby. When the alarm sounded residents and horses would have a 20 minute window to leave. So I hang up and call the vet I used to work for to borrow her truck and 3 horse trailer. We had a few trailers on the ranch but I figured the more the better. Castle Peak Ranch used to be one large property, but then was sold off in lots of 5-55 acres, with about 100 horses up there (just my own estimate). Our ranch has 2 full horses, 2 minis and a mini donkey. I figured other people might need help hauling so the more the better. In the middle of making trailering plans, the phone rings at the house in Cordillera where I am dog sitting, alerting residents to the fire and saying Castle Peak Ranch is on 20 minute evac standby. Officially confirmed, and my heartrate about triples. The ranch is up a small dirt road and is a gated community. I just envisioned a traffic jam of trailers and a fire rolling in. We head out. My husband grabs the rig and I follow behind him down the freeway. My phone goes off, and I almost didn’t read the FB post (who has time for FB with a fire?) but the post mentioned evacs so I pulled over and read it. It says Cordillera is evacuating!!! That there is a second fire on Bellyache! My house is right next to Cordillera at the end of Bellyache (technically my address is Cordillera but we aren’t part of the ritzy community) and the house I’m dog sitting at is in Cordillera. So now I panic and am torn- do I go to the horse with the confirmed fire, or do I have to worry about my non-horse pets and belongings? After quite a few phone calls I make it through to the Public Safety office at Cordillera and the alarm is false. No fire on Bellyache, no evacs. The people who panicked just probably didn’t listen to the full phone recording that went around. So I head to the ranch. It’s organized, quiet, high-anxiety panic up there. No one was “freaking out” but the tension was thick and the attention to detail high. Hay was getting hauled out by the truck load, trailers were lining driveways, police and firefighters everywhere. Lists of who was going in and out, descriptions. Oh yeah- and SMOKE. This was for real. At this point we couldn’t see flames anymore (a few of my friends on neighboring ranches and houses were giving me play-by-plays.) Army copters were dropping the 3,000 gal buckets pretty close to the ranch, and the flame retardant had already been dropped. The poor horses were so anxiety and panic ridden. At our specific ranch things were quiet. The owners were packed up and ready to go, and our horses were calmer than the neighbors. Cello was pretty okay, but you could see in his eyes how worried he was. That made two of us, buddy! We hung out at the ranch pretty late, just watching the fighting efforts. Air support was called off around sunset, and the evac notice still stood but things were under control. In the beginning the reports were “panic” “don’t panic,” changing every hour. The last “don’t panic” was at sunset, and as it stuck for a few hours we decided to head home and not evacuate the animals. Smoke had cleared quite a bit and no flames had been spotted close by for some time. Spencer (ranch owner) had extra trailers on standby and we weren’t lacking on destinations once the horses were out of Castle Peak, so we went back up valley. Lightning (which started this fire) was still striking so we figured we should be a little spread out, in case something started closer to home. This was the 3rd fire we were up close and personal with. When we went to pick up Cello, the High Park fire had just started and the smoke was a thin “plume” like the mountain had a chimney stack releasing it. By the time the makeover was over, all of Ft. Collins was covered in smoke. Wednesday night we went to Glenwood Springs to test drive a Jeep, and we saw a 2 acre fire (huge flames) behind a neighborhood. That one was put out ASAP and no damage appeared to be caused. Now a fire at Castle Peak/Eby Creek! It makes me have even more empathy for people in the Ft. Collins area/Waldo Canyon/High Part/Co. Springs fires. I can’t even imagine having to actually deal with the evac and the damage. My heart goes out to them. We need rain, that comes without lightening!!! For now, everyone here is safe. This entry was posted in Uncategorized and tagged blm mustange, castle peak fire, castle peak ranch, Cello, Dani Neumann, eby creek fire, Extreme Mustang Makeover. Bookmark the permalink.